The crisp smell of autumn in the air, the twists and turns through towering stalks of corn. There’s nothing like a corn maze in the fall. It’s the perfect group activity, whether you’re visiting with friends or family, it’s a great way to celebrate local farms, and it’s the ultimate way to welcome in the harvest season. For some wholesome good fun, check out these 10 corn mazes in North Carolina! The opening weekend for Garner’s Corn Maze is mid-September, and is sure to bring with it even more fun than last year. From the time they maze was first getting cut, it was clear it was going to be extraordinary this year. They will remain open through early November. Willie Nelson’s granddaughter, Raelyn Nelson, is performing during the opening weekend. The corn maze at Aw Shucks! Will be open from mid-September through mid-November. Be sure to bring a flashlight if visiting at night. Talk to the management about booking a corn maze party, which is perfect for older kids/teens. The seven-acre corn maze at Harvest Farm makes for an exciting adventure for the whole family. Come in the evening and enjoy the flashlight maze. (Be sure to BYOF—bring your own flashlight!) Opening day is late September. Check the website for specific dates and times for both the regular maze and the flashlight maze. Opening in mid-September, New River Corn Maze at the Brown Family Farm offers families the perfect place to spend the day. Get lost in the maze, enjoy a tram ride around the farm, and pack a picnic. There’s no better way to enjoy a beautiful fall day. The maze is open on Fridays and Saturdays from 10 a.m. to dark, and on Sundays from 1 p.m. to dark. The Johnny Wilson Farm not only has an exciting three-acre corn maze, it has family members dedicated to teaching kids, families, and small groups all about farm life. In addition to playing in the maze, visit with the animals and enjoy a tram ride. Admission to the maze includes a pumpkin from their pumpkin patch, too. This year’s maze opens in late September and will remain open until early November. Enjoy miles of adventure at Maize Adventure, dubbed the “most famous corn maze in North Carolina.” Leashed dogs are welcome, too, as there is plenty of space for them to enjoy a walk. There’s even a doggy bar set up for them. (Dog-tinis, maybe?) Lots of additional activities—a pumpkin patch, jumping pillows, a gem dig and more—make for an exciting day for the whole family. The corn maze at Devine Farms will be open weekends in October. Visit on Saturdays between 10 a.m. and 9 p.m. or Sundays from 2 p.m. to 8 p.m. This family owned and operated farm wants guests to experience farm life, so there are many additional hands-on activities the whole family will enjoy. Arrangements for group corn maze adventures may be scheduled for weeknights. Call for more information. Open mid-September through mid-November, the maze at Hubb’s Farm is even more spectacular this year than last. 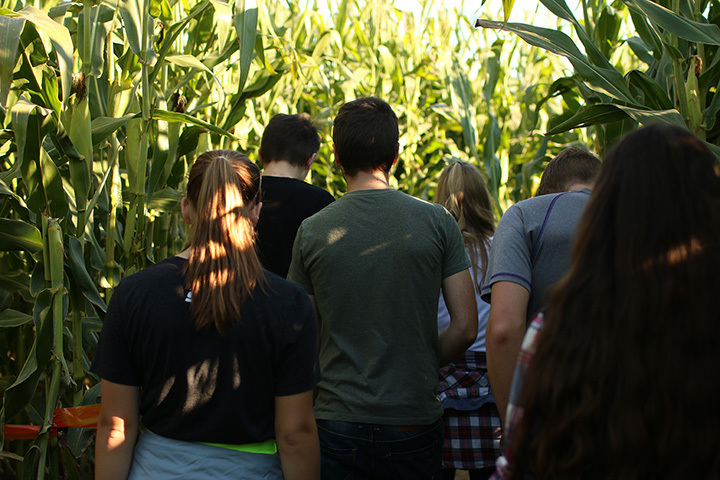 Get lost in the corn stalks, but be sure to save some time and energy to explore the rest of the farm and the countless activities on hand. You can easily spend the whole day here. The theme of this year’s Country Days Corn Maze is movies. Visitors will find movie-related activities and scenery throughout the intricate maze. A helpful hint: Those will a flair for movie trivia will make out better than those without! The maze is open starting in late September through early November. Call for specific times and for group bookings. View more North Carolina Corn Mazes.